E.M.R.S. has commissioned Bachmann to produce this wagon on the occasion of our 50th anniversary. 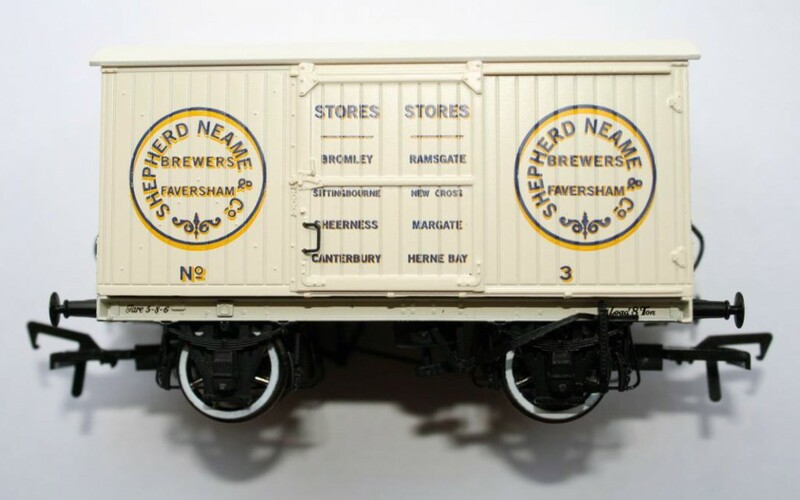 Shepherd Neame are the oldest (continious) brewers in the U.K. situated in Faversham, Kent. They have been brewing there since 1698. During Victorian times, production increased and stores of their supplies and products grew in the South East to include Bromley, Ramsgate, Sittingbourne, New Cross, Sherness, Margate, Canterbury and Herne Bay. In the late 19th centuary the company had several railway vans built for the transportation of their goods around Kent and the London area, via the London Dover & Chatham Railway ( L.D.C.R. ) and South Eastern Railway ( S.E.R.) and upon the merger in 1899 of these two competing companies the South Eastern and Chatham Railway. These South East locations are shown on the Van and therefore may appeal to modellers and collectors in these areas. This Limited Edition is available through the Erith Model Railway Society, contactable on erithmrs@gmail.com or 07736560956. The price per van is £11.95 + £2.95 p&p (for the first van 2 or more vans £4.50). Orders are limited to a maximum of 4 per person.